The virtual Sun gear has a significant use as a TQ multiplier. Not really related but has a great perspective of sophisticated Jack Shafts. Jack: "sub board layer interference disk "perspective model" ? With the deepest respect - perhaps a liberal dose of "Occam's razor" might help (or perhaps the art of complication is also a necessary strategy to stop competitors stealing your idea)? The hard part is making others see it and for what is directly in front of them in plain sight. Six counter sub board rotation disks and one reverse PTO disk on center axis. Think about what makes a simple DC motor commence using current to become the opposed electro magnet and than envision this happening mechanically, further moving the field into position to push the commenced direction and completion never ending until mechanicals fall apart from wear because it "isn't" perpetual motion. NIX .....No more commutated and stator method....... or the copper windings all gone! No power source to drive it other than static rare earth being manipulated to interfere with itself at the timed index orbit. Moving the fields into a managed position is the key to doing useful work and no longer a hypothesis. Last edited by Jack@European_Parts; 05-21-2017 at 09:29 AM. Various electric motors, compared to 9 V battery. Perhaps the first electric motors were simple electrostatic devices created by the Scottish monk Andrew Gordon in the 1740s. The theoretical principle behind production of mechanical force by the interactions of an electric current and a magnetic field, Ampère's force law, was discovered later by André-Marie Ampère in 1820. The conversion of electrical energy into mechanical energy by electromagnetic means was demonstrated by the English scientist Michael Faraday in 1821. A free-hanging wire was dipped into a pool of mercury, on which a permanent magnet (PM) was placed. When a current was passed through the wire, the wire rotated around the magnet, showing that the current gave rise to a close circular magnetic field around the wire. This motor is often demonstrated in physics experiments, brine substituting for toxic mercury. Though Barlow's wheel was an early refinement to this Faraday demonstration, these and similar homopolar motors were to remain unsuited to practical application until late in the century. In 1827, Hungarian physicist Ányos Jedlik started experimenting with electromagnetic coils. After Jedlik solved the technical problems of the continuous rotation with the invention of the commutator, he called his early devices "electromagnetic self-rotors". Although they were used only for instructional purposes, in 1828 Jedlik demonstrated the first device to contain the three main components of practical DC motors: the stator, rotor and commutator. The device employed no permanent magnets, as the magnetic fields of both the stationary and revolving components were produced solely by the currents flowing through their windings. 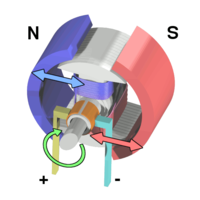 After many other more or less successful attempts with relatively weak rotating and reciprocating apparatus the Prussian Moritz von Jacobi created the first real rotating electric motor in May 1834 that actually developed a remarkable mechanical output power. His motor set a world record which was improved only four years later in September 1838 by Jacobi himself. His second motor was powerful enough to drive a boat with 14 people across a wide river. It was not until 1839/40 that other developers worldwide managed to build motors of similar and later also of higher performance. The first commutator DC electric motor capable of turning machinery was invented by the British scientist William Sturgeon in 1832. Following Sturgeon's work, a commutator-type direct-current electric motor made with the intention of commercial use was built by the American inventor Thomas Davenport, which he patented in 1837. The motors ran at up to 600 revolutions per minute, and powered machine tools and a printing press. Due to the high cost of primary battery power, the motors were commercially unsuccessful and Davenport went bankrupt. Several inventors followed Sturgeon in the development of DC motors but all encountered the same battery power cost issues. No electricity distribution had been developed at the time. Like Sturgeon's motor, there was no practical commercial market for these motors. In 1886, Frank Julian Sprague invented the first practical DC motor, a non-sparking motor that maintained relatively constant speed under variable loads. Other Sprague electric inventions about this time greatly improved grid electric distribution (prior work done while employed by Thomas Edison), allowed power from electric motors to be returned to the electric grid, provided for electric distribution to trolleys via overhead wires and the trolley pole, and provided controls systems for electric operations. This allowed Sprague to use electric motors to invent the first electric trolley system in 1887–88 in Richmond VA, the electric elevator and control system in 1892, and the electric subway with independently powered centrally controlled cars, which were first installed in 1892 in Chicago by the South Side Elevated Railway where it became popularly known as the "L". Sprague's motor and related inventions led to an explosion of interest and use in electric motors for industry, while almost simultaneously another great inventor was developing its primary competitor, which would become much more widespread. The development of electric motors of acceptable efficiency was delayed for several decades by failure to recognize the extreme importance of a relatively small air gap between rotor and stator. Efficient designs have a comparatively small air gap. [a] The St. Louis motor, long used in classrooms to illustrate motor principles, is extremely inefficient for the same reason, as well as appearing nothing like a modern motor. Application of electric motors revolutionized industry. Industrial processes were no longer limited by power transmission using line shafts, belts, compressed air or hydraulic pressure. Instead every machine could be equipped with its own electric motor, providing easy control at the point of use, and improving power transmission efficiency. Electric motors applied in agriculture eliminated human and animal muscle power from such tasks as handling grain or pumping water. Household uses of electric motors reduced heavy labor in the home and made higher standards of convenience, comfort and safety possible. Today, electric motors stand for more than half of the electric energy consumption in the US. In 1824, the French physicist François Arago formulated the existence of rotating magnetic fields, termed Arago's rotations, which, by manually turning switches on and off, Walter Baily demonstrated in 1879 as in effect the first primitive induction motor. In the 1880s, many inventors were trying to develop workable AC motors because AC's advantages in long-distance high-voltage transmission were counterbalanced by the inability to operate motors on AC. The first alternating-current commutatorless induction motors were independently invented by Galileo Ferraris and Nikola Tesla, a working motor model having been demonstrated by the former in 1885 and by the latter in 1887. In 1888, the Royal Academy of Science of Turin published Ferraris's research detailing the foundations of motor operation while however concluding that "the apparatus based on that principle could not be of any commercial importance as motor." In 1888, Tesla presented his paper A New System for Alternating Current Motors and Transformers to the AIEE that described three patented two-phase four-stator-pole motor types: one with a four-pole rotor forming a non-self-starting reluctance motor, another with a wound rotor forming a self-starting induction motor, and the third a true synchronous motor with separately excited DC supply to rotor winding. One of the patents Tesla filed in 1887, however, also described a shorted-winding-rotor induction motor. George Westinghouse promptly bought Tesla's patents, employed Tesla to develop them, and assigned C. F. Scott to help Tesla; however, Tesla left for other pursuits in 1889. The constant speed AC induction motor was found not to be suitable for street cars, but Westinghouse engineers successfully adapted it to power a mining operation in Telluride, Colorado in 1891. Steadfast in his promotion of three-phase development, Mikhail Dolivo-Dobrovolsky invented the three-phase cage-rotor induction motor in 1889 and the three-limb transformer in 1890. This type of motor is now used for the vast majority of commercial applications. However, he claimed that Tesla's motor was not practical because of two-phase pulsations, which prompted him to persist in his three-phase work. Although Westinghouse achieved its first practical induction motor in 1892 and developed a line of polyphase 60 hertz induction motors in 1893, these early Westinghouse motors were two-phase motors with wound rotors until B. G. Lamme developed a rotating bar winding rotor. The General Electric Company began developing three-phase induction motors in 1891. By 1896, General Electric and Westinghouse signed a cross-licensing agreement for the bar-winding-rotor design, later called the squirrel-cage rotor. Induction motor improvements flowing from these inventions and innovations were such that a 100 horsepower (HP) induction motor currently has the same mounting dimensions as a 7.5 HP motor in 1897. In an electric motor the moving part is the rotor which turns the shaft to deliver the mechanical power. The rotor usually has conductors laid into it which carry currents that interact with the magnetic field of the stator to generate the forces that turn the shaft. However, some rotors carry permanent magnets, and the stator holds the conductors. The distance between the rotor and stator is called the air gap. The air gap has important effects, and is generally as small as possible, as a large gap has a strong negative effect on the performance of an electric motor. It is the main source of the low power factor at which motors operate.The air gap increases the magnetizing current needed. For this reason, the air gap should be minimal. Very small gaps may pose mechanical problems in addition to noise and losses. Electric machines come in two basic magnet field pole configurations: salient-pole machine and nonsalient-pole machine. In the salient-pole machine the pole's magnetic field is produced by a winding wound around the pole below the pole face. In the nonsalient-pole, or distributed field, or round-rotor, machine, the winding is distributed in pole face slots. A shaded-pole motor has a winding around part of the pole that delays the phase of the magnetic field for that pole. Some motors have conductors which consist of thicker metal, such as bars or sheets of metal, usually copper, although sometimes aluminum is used. These are usually powered by electromagnetic induction. A commutator is a mechanism used to switch the input of most DC machines and certain AC machines consisting of slip ring segments insulated from each other and from the electric motor's shaft. The motor's armature current is supplied through the stationary brushes in contact with the revolving commutator, which causes required current reversal and applies power to the machine in an optimal manner as the rotor rotates from pole to pole. In absence of such current reversal, the motor would brake to a stop. In light of significant advances in the past few decades due to improved technologies in electronic controller, sensorless control, induction motor, and permanent magnet motor fields, electromechanically commutated motors are increasingly being displaced by externally commutated induction and permanent-magnet motors. Variable speed controlled AC motors are provided with a range of different power inverter, variable-frequency drive or electronic commutator technologies. A fractional horsepower (FHP) motor either has a rating below about 1 horsepower (0.746 kW), or is manufactured with a standard frame size smaller than a standard 1 HP motor. Many household and industrial motors are in the fractional horsepower class. Rotation is equal to synchronous speed (motor stator field speed). In SCIM fixed-speed operation rotation is equal to synchronous speed less slip speed. In non-slip energy recovery systems WRIM is usually used for motor starting but can be used to vary load speed. Whereas induction and synchronous motor drives are typically with either six-step or sinusoidal waveform output, BLDC motor drives are usually with trapezoidal current waveform; the behavior of both sinusoidal and trapezoidal PM machines is however identical in terms of their fundamental aspects. In variable-speed operation WRIM is used in slip energy recovery and double-fed induction machine applications. All self-commutated DC motors are by definition run on DC electric power. Most DC motors are small PM types. They contain a brushed internal mechanical commutation to reverse motor windings' current in synchronism with rotation. Many of the limitations of the classic commutator DC motor are due to the need for brushes to press against the commutator. This creates friction. Sparks are created by the brushes making and breaking circuits through the rotor coils as the brushes cross the insulating gaps between commutator sections. Depending on the commutator design, this may include the brushes shorting together adjacent sections – and hence coil ends – momentarily while crossing the gaps. Furthermore, the inductance of the rotor coils causes the voltage across each to rise when its circuit is opened, increasing the sparking of the brushes. This sparking limits the maximum speed of the machine, as too-rapid sparking will overheat, erode, or even melt the commutator. The current density per unit area of the brushes, in combination with their resistivity, limits the output of the motor. The making and breaking of electric contact also generates electrical noise; sparking generates RFI. Brushes eventually wear out and require replacement, and the commutator itself is subject to wear and maintenance (on larger motors) or replacement (on small motors). The commutator assembly on a large motor is a costly element, requiring precision assembly of many parts. On small motors, the commutator is usually permanently integrated into the rotor, so replacing it usually requires replacing the whole rotor. Armature circuit - A winding where the load current is carried, such that can be either stationary or rotating part of motor or generator. Field circuit - A set of windings that produces a magnetic field so that the electromagnetic induction can take place in electric machines. The BLDC motor's characteristic trapezoidal back-emf waveform is derived partly from the stator windings being evenly distributed, and partly from the placement of the rotor's PMs. 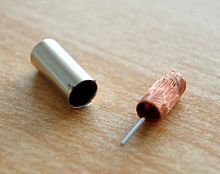 Also known as electronically commutated DC or inside out DC motors, the stator windings of trapezoidal BLDC motors can be with single-phase, two-phase or three-phase and use Hall effect sensors mounted on their windings for rotor position sensing and low cost closed-loop control of the electronic commutator. BLDC motors have no chance of sparking, unlike brushed motors, making them better suited to environments with volatile chemicals and fuels. Also, sparking generates ozone which can accumulate in poorly ventilated buildings risking harm to occupants' health. They are also acoustically very quiet motors which is an advantage if being used in equipment that is affected by vibrations. The SRM has no brushes or PMs, and the rotor has no electric currents. Instead, torque comes from a slight misalignment of poles on the rotor with poles on the stator. The rotor aligns itself with the magnetic field of the stator, while the stator field windings are sequentially energized to rotate the stator field. SRMs are now being used in some appliances. An advantage of the universal motor is that AC supplies may be used on motors which have some characteristics more common in DC motors, specifically high starting torque and very compact design if high running speeds are used. The negative aspect is the maintenance and short life problems caused by the commutator. Such motors are used in devices such as food mixers and power tools which are used only intermittently, and often have high starting-torque demands. Multiple taps on the field coil provide (imprecise) stepped speed control. Household blenders that advertise many speeds frequently combine a field coil with several taps and a diode that can be inserted in series with the motor (causing the motor to run on half-wave rectified AC). Universal motors also lend themselves to electronic speed control and, as such, are an ideal choice for devices like domestic washing machines. The motor can be used to agitate the drum (both forwards and in reverse) by switching the field winding with respect to the armature. Induction motors may be further divided into Squirrel Cage Induction Motors and Wound Rotor Induction Motors. SCIMs have a heavy winding made up of solid bars, usually aluminum or copper, joined by rings at the ends of the rotor. When one considers only the bars and rings as a whole, they are much like an animal's rotating exercise cage, hence the name. A torque motor is a specialized form of electric motor which can operate indefinitely while stalled, that is, with the rotor blocked from turning, without incurring damage. In this mode of operation, the motor will apply a steady torque to the load (hence the name). A synchronous electric motor is an AC motor distinguished by a rotor spinning with coils passing magnets at the same rate as the AC and resulting magnetic field which drives it. Another way of saying this is that it has zero slip under usual operating conditions. Contrast this with an induction motor, which must slip to produce torque. One type of synchronous motor is like an induction motor except the rotor is excited by a DC field. Slip rings and brushes are used to conduct current to the rotor. The rotor poles connect to each other and move at the same speed hence the name synchronous motor. Another type, for low load torque, has flats ground onto a conventional squirrel-cage rotor to create discrete poles. Yet another, such as made by Hammond for its pre-World War II clocks, and in the older Hammond organs, has no rotor windings and discrete poles. It is not self-starting. The clock requires manual starting by a small knob on the back, while the older Hammond organs had an auxiliary starting motor connected by a spring-loaded manually operated switch. Finally, hysteresis synchronous motors typically are (essentially) two-phase motors with a phase-shifting capacitor for one phase. They start like induction motors, but when slip rate decreases sufficiently, the rotor (a smooth cylinder) becomes temporarily magnetized. Its distributed poles make it act like a PMSM. The rotor material, like that of a common nail, will stay magnetized, but can also be demagnetized with little difficulty. Once running, the rotor poles stay in place; they do not drift. Low-power synchronous timing motors (such as those for traditional electric clocks) may have multi-pole PM external cup rotors, and use shading coils to provide starting torque. Telechron clock motors have shaded poles for starting torque, and a two-spoke ring rotor that performs like a discrete two-pole rotor. 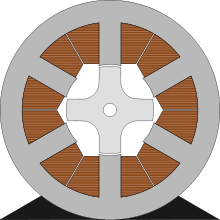 Nothing in the principle of any of the motors described above requires that the iron (steel) portions of the rotor actually rotate. If the soft magnetic material of the rotor is made in the form of a cylinder, then (except for the effect of hysteresis) torque is exerted only on the windings of the electromagnets. Taking advantage of this fact is the coreless or ironless DC motor, a specialized form of a PM DC motor. Optimized for rapid acceleration, these motors have a rotor that is constructed without any iron core. The rotor can take the form of a winding-filled cylinder, or a self-supporting structure comprising only the magnet wire and the bonding material. The rotor can fit inside the stator magnets; a magnetically soft stationary cylinder inside the rotor provides a return path for the stator magnetic flux. A second arrangement has the rotor winding basket surrounding the stator magnets. In that design, the rotor fits inside a magnetically soft cylinder that can serve as the housing for the motor, and likewise provides a return path for the flux. The vibrating alert of cellular phones is sometimes generated by tiny cylindrical PM field types, but there are also disc-shaped types which have a thin multipolar disc field magnet, and an intentionally unbalanced molded-plastic rotor structure with two bonded coreless coils. Metal brushes and a flat commutator switch power to the rotor coils. Related limited-travel actuators have no core and a bonded coil placed between the poles of high-flux thin PMs. These are the fast head positioners for rigid-disk ("hard disk") drives. Although the contemporary design differs considerably from that of loudspeakers, it is still loosely (and incorrectly) referred to as a "voice coil" structure, because some earlier rigid-disk-drive heads moved in straight lines, and had a drive structure much like that of a loudspeaker. A rather unusual motor design, the printed armature or pancake motor has the windings shaped as a disc running between arrays of high-flux magnets. The magnets are arranged in a circle facing the rotor with space in between to form an axial air gap. This design is commonly known as the pancake motor because of its extremely flat profile, although the technology has had many brand names since its inception, such as ServoDisc. An alternative manufacturing method is to use wound copper wire laid flat with a central conventional commutator, in a flower and petal shape. The windings are typically stabilized by being impregnated with electrical epoxy potting systems. These are filled epoxies that have moderate mixed viscosity and a long gel time. They are highlighted by low shrinkage and low exotherm, and are typically UL 1446 recognized as a potting compound insulated with 180 °C, Class H rating. The unique advantage of ironless DC motors is that there is no cogging (torque variations caused by changing attraction between the iron and the magnets). Parasitic eddy currents cannot form in the rotor as it is totally ironless, although iron rotors are laminated. This can greatly improve efficiency, but variable-speed controllers must use a higher switching rate (>40 kHz) or DC because of the decreased electromagnetic induction. These motors were originally invented to drive the capstan(s) of magnetic tape drives in the burgeoning computer industry, where minimal time to reach operating speed and minimal stopping distance were critical. Pancake motors are still widely used in high-performance servo-controlled systems, robotic systems, industrial automation and medical devices. Due to the variety of constructions now available, the technology is used in applications from high temperature military to low cost pump and basic servos. A servomotor is a motor, very often sold as a complete module, which is used within a position-control or speed-control feedback control system mainly control valves, such as motor-operated control valves. Servomotors are used in applications such as machine tools, pen plotters, and other process systems. Motors intended for use in a servomechanism must have well-documented characteristics for speed, torque, and power. The speed vs. torque curve is quite important and is high ratio for a servo motor. Dynamic response characteristics such as winding inductance and rotor inertia are also important; these factors limit the overall performance of the servomechanism loop. Large, powerful, but slow-responding servo loops may use conventional AC or DC motors and drive systems with position or speed feedback on the motor. As dynamic response requirements increase, more specialized motor designs such as coreless motors are used. AC motors' superior power density and acceleration characteristics compared to that of DC motors tends to favor PM synchronous, BLDC, induction, and SRM drive applications. A servo system differs from some stepper motor applications in that the position feedback is continuous while the motor is running; a stepper system relies on the motor not to "miss steps" for short term accuracy, although a stepper system may include a "home" switch or other element to provide long-term stability of control. For instance, when a typical dot matrix computer printer starts up, its controller makes the print head stepper motor drive to its left-hand limit, where a position sensor defines home position and stops stepping. As long as power is on, a bidirectional counter in the printer's microprocessor keeps track of print-head position. Stepper motors are a type of motor frequently used when precise rotations are required. In a stepper motor an internal rotor containing PMs or a magnetically soft rotor with salient poles is controlled by a set of external magnets that are switched electronically. A stepper motor may also be thought of as a cross between a DC electric motor and a rotary solenoid. As each coil is energized in turn, the rotor aligns itself with the magnetic field produced by the energized field winding. Unlike a synchronous motor, in its application, the stepper motor may not rotate continuously; instead, it "steps"—starts and then quickly stops again—from one position to the next as field windings are energized and de-energized in sequence. Depending on the sequence, the rotor may turn forwards or backwards, and it may change direction, stop, speed up or slow down arbitrarily at any time. So-called quartz analog wristwatches contain the smallest commonplace stepping motors; they have one coil, draw very little power, and have a PM rotor. The same kind of motor drives battery-powered quartz clocks. Some of these watches, such as chronographs, contain more than one stepping motor. ^^^^ Jack: I haven't seen this much motor design theory since I last opened my text books long, long time ago - way back last century when Wikipedia wasn't even a thought in Wales' and Sanger's minds. But of course, as you know, the major advantage of DC style motors is that they achieve maximum torque at zero RPM. Which brings me back to my previous question - regarding the quantity of output power from your invention. Even using rare earth magnets, and notwithstanding any innovation in the design of a brush-less commutator - without additional input energy from an external electrical current, how much power does your device output? Which is really another way of me asking- how much work does your device output as a stand alone unit? Well I have built units that produced 600 FT pounds of starting TQ from zero. No brushes and not brushless .........no commutator! PTO is dictated by the size of the static magnet pulling/pushing force weight ability. This was a huge mistake I made in the very beginning when getting custom magnets that were an Inch cubed in diameter & with a pull strength of over 500 Pounds each. These magnets were almost impossible to remove around certain ferrous materials and very dangerous if not handled carefully. 4) Use one of our	Pole Identifier Devices. Yes. Neodymium Iron Boron magnets are sensitive to heat. If a magnet heated above its maximum operating temperature (176°F (80°C) for standard N grades) the magnet will permanently lose a fraction of its magnetic strength. If they are heated above their Curie temperature (590°F (310°C) for standard N grades), they will lose all of their magnetic properties. Different grades of neodymium different maximum operating and Curie temperatures. 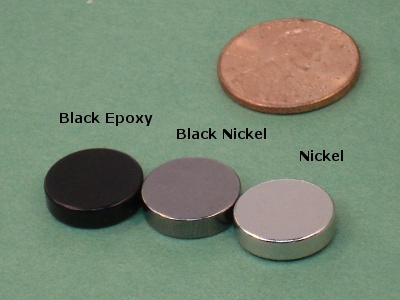 See our	Neodymium Magnet Specifications Page for more details. We do stock a range of	high temperature magnets, which you can see	here. This depends on the context it is used. Most magnetic therapy people like to present the largest number possible, so they often use the	Residual Flux Density (Brmax) of the material, which really doesn't specify much about the actual magnet. This value is essentially the magnetic field density inside the magnet material. Since you will never be inside the magnet, or using the field inside the magnet, this value doesn't really have any practical value. The	surface field of a magnet is a much more accurate specification for a magnet. The surface field is exactly what it sounds like. It is the magnetic field density at the surface of the magnet as measured by a Gaussmeter. This value is tested and specified for each of our stock magnets. A comprehensive table of the surface field density for each of our stock magnets can be seen here:	Magnet Summary Table. Just about anything you can imagine! Please see our	Uses Page for a list of some of the applications for these incredible magnets. As mentioned above, the iron in the NdFeB material will oxidize if it is exposed to moisture. For this reason, we do not stock any unplated magnets. We can supply unplated magnets as	custom order items. We have found that wrapping magnets with a few layers of electrical tape protects them from most damage caused by collisions with other magnets and hard surfaces. Another great way to protect your magnets from damage and the elements is to coat them with	rubberized coating. We have created a page with	step-by-step instructions on how to do this. We also stock several sizes and shapes of	plastic-coated and rubber-coated magnets. Maybe. Each size of plastic- and rubber-coated magnet requires its own special mold. These molds cost anywhere from $300-$2500, depending on the size and shape. If you are in need of a large quantity, creating a new mold may be worthwhile. If you only need a few, then	doing your own rubber-coating may be a more cost-effective solution. 48. Are there health or safety concerns with neo magnets? There are no known health concerns with exposure to permanent magnetic fields. In fact, many people believe that magnets can be used to speed up the healing process. There may be issues with people with pacemakers or other implanted medical devices handling or being around strong magnets. We are not medical professionals, so we cannot offer complete	guidance on pacemaker safety. We've shared what we do know in our article about Pacemaker Safety. Please consult a physician for this information. There are several safety concerns when handling strong magnets. Please refer to our Safety Page for complete details. 49. What is a safe distance to keep magnets away from pacemakers? 50. Will magnets harm my electronics? 51. How far away from electronics should I keep my magnets? 52. Will using magnets on my refrigerator, stove, oven, or microwave harm the appliance? 53. Will magnets erase my hard drive or harm my computer? 54. I am developing a product using magnets. Do I have to put a safety warning on it about pacemakers/electronics? 55. Can I use neodymium magnets to trigger traffic lights with my motorcycle/moped/bicycle? This one is a definite "maybe". We have received feedback that magnets as small as our	D84 discs have successfully triggered traffic lights, but we have also received reports that magnets as large as our	DX8C have failed to trip similar traffic light sensors. It seems that there are different types and different sensitivities of traffic light sensors, and magnets will trigger some, but not all of them. If you have any feedback or good information on this, we would appreciate an email with any details you may have. 56. Which magnets should I use for holding knives to my fridge? For small knives, small magnets like our	B444 cubes are sufficient. For butcher knives and other large knives, we recommend our BX084 blocks. Mid-sized knives can be held to a refrigerator using our	B884 blocks. 57. Which magnets should I use for holding spice cans to my fridge? The answer varies depending on the size of the can and the weight of the items being stored. Magnets as small as our	D81 discs can be used to hold smaller cans, while magnets as large as our	DC2 discs may be required to hold very large cans. 58. I am looking for the equivalent of a magician's M5/PK5 magnet. Which of your magnets is the equivalent? The magician's M5 (aka PK5) magnet is the equivalent of our	BY0Y08 block magnet. 59. I am making magnetic earrings. Which magnets should I use? The best size varies, depending on the size of the decorations being held. Generally, the best options are discs like our	D31-N52 or	D41-N52. Other magnets of similar size can also be used. 60. I would like to erase hard drives/degauss tapes. Which magnet should I use? 61. Which magnets should I use for magnetic therapy? A wide range of sizes can be used for magnetic therapy. Many people use magnets as small as our	D41 discs for spot treatment, while others use magnets as large as our	DY04 discs for large area treatment. It is best to select a size that "fits" the area being treated. 62. I would like to use magnets for water treatment. Which magnets should I use? 63. Which magnets should I use for holding pictures and papers to my refrigerator? For refrigerator magnets, there are many options. We carry a neat line of	magnetic thumbtacks as well as dozens of other shapes and sizes that work well. A few suggestions are our	D42,	D34,	B333,	S4 (also available in black color or gold), and	ST4 stars. Many other magnets of similar sizes will also work very well for fridge magnets. 64. Which magnets should I use for holding pins/badges through clothing instead of using pins? For holding average-sized pins and badges, we recommend our	D62 disc magnets, as they provide the appropriate amount of pull strength through a wide range of fabric thicknesses. If you will be holding large or heavy pins or badges, or will be holding through exceptionally thick material, then our	D72 or D82 discs may be necessary to provide enough holding force. 65. I heard you can repair dents in brass instruments using magnets. How can I do this? Dent removal is accomplished by inserting a steel ball into the instrument as close to, but smaller than, the diameter of the section of tubing being repaired. The steel ball can be moved through the tube using a magnet on the outside. Working the steel ball over the damaged area will gradually smooth out the dent. A magnet like our	DX0X0 will pull out most small- and medium-sized dents, while a larger magnet like our	DX8C may be necessary for larger and more stubborn dents. We do carry a line of	steel balls that can be used for this application. 66. I need magnets for a binder/brochure closure. Which magnets work for this? We have many printers and other customers that use our magnets in brochures and binders to hold them closed. The most common sizes used for brochures and binders are our	D401, D41, D501, D51, D601, D61, D701, D71, D801, D81	disc magnets, and our	B4401,	B441,	B6301,	B631,	B661,	B821,	B841,	B8801, and	B881 block magnets, but larger sizes can also be used for larger applications. 67. I am trying to order online, but every time I add something to my shopping cart, I get a message that my cart is empty. What do I need to do? 68. I don't want to put my credit card info online. Is there some other way I can pay? We take every measure possible to ensure that your online transaction with us is secure. You can read more about this on our	Security Page. If you would still prefer not to order online, there are many other ways to place an order with us. Please see our Ordering/Shipping Page for more details. 69. Can I get the quantity discount pricing for an odd quantity of magnets (i.e. quantity of 87)? 70. Can I open an account with K&J Magnetics? 71. Can you just put my magnets in a small envelope to save postage? No. All magnets must be shipped in a box in order to comply with United States Department of Transportation, USPS, UPS, and FedEx regulations for the shipment of magnetic materials. 72. Where can I get a discount code? You can receive discounts by joining our	Mailing List. Our periodic newsletter (sent once every month or two) contains news, new products and Mailing List-only coupons and specials! 73. Where are you located? 74. Do you have a local distributor near me? 75. Do you have an affiliate program? Yes, we do. If you have a website and would like to earn commissions for sales generated by your link to our store,	please email us for details. This law requires reporting of the use of columbite-tantalite (tantalum, used in capacitors), cassiterite (used to make tin), wolframite (tungsten) and gold that comes from mines located in the eastern part of the Democratic Reublic of Congo. Since neodymium magnets don't usually contain these elements, they shouldn't be covered by this law. Learn more about what elements are used in the manufacture of neodymium magnets in our article: How Neodymium Magnets are Made. Last edited by Jack@European_Parts; 05-21-2017 at 05:54 PM. Brian Greene, Columbia University physicist and co-founder of the World Science Festival, explains how today's physicists and mathematicians use an Einsteinian formula to explain the universe that Einstein himself originally thought was false. The amazing thing is that blunder in Einstein’s mind is something that we now believe describes the actual universe. Einstein became Einstein really because of his discovery of the general theory of relativity in 1915. The core of it are the Einstein field equations. And that’s a set of equations that relate the curvature of spacetime to the amount of matter and energy moving through a region of spacetime. Interesting when Einstein applied theses equations to the entire universe, he found a result that he wasn’t happy with. He found that the universe could not be static and unchanging. It had to be either stretching or contracting. And he said, “no.” The universe is clearly static and eternal. So what did he do? He went back to the equations.Put in one more term. On the left hand side he put in lambda. Lambda is what’s called the cosmological constant. He called it the cosmological member. And what it does is it can kind of give an outward push that can stabilize the inward pull of gravity, resulting in a static universe.And then Einstein was happy. Right? Ugh, I wish I would not have put that term in. Because my equations predicted that the universe is expanding and I would have gotten there 12 years before the observations. Today the amazing thing is that blunder in Einstein’s mind is something that we now believe describes the actual universe. Because when we found that the accelerated expansion is happening, we want something that can push everything apart. What can do that?Einstein’s cosmological constant pushes things apart. We employ a different value.A different number than Einstein would have thought. But the idea is exactly what Einstein came up with. Even Einstein’s bad ideas wind up being pretty darn good. How many VW Mk1 clutch alignment tools do you own, anyway???? ?